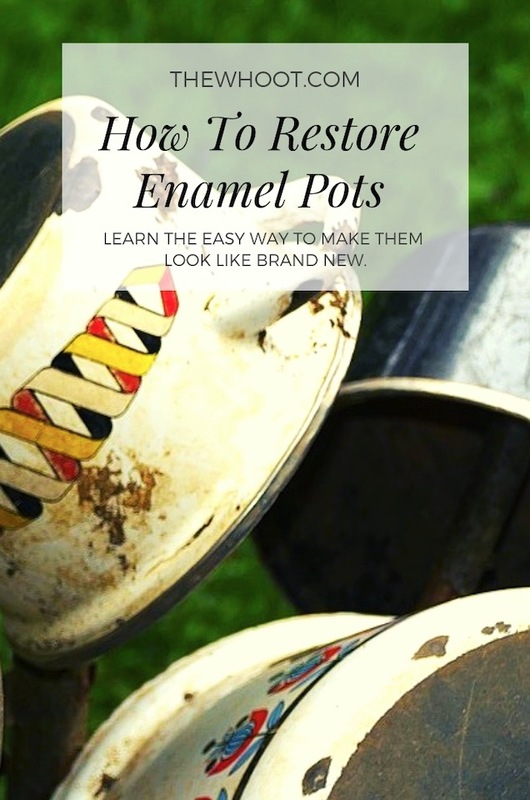 It’s easy to clean up and remove stains from your favorite Enamel Pots with these easy tips that you will not want to miss. Be sure to check them all out now. Are you one of many who loves to make and bake with Enameled Cookware? It’s a much healthier way to cook compared to copper, non-stick and steel, given the leaching of chemicals. As you can see from the Infographic from Consiglio’s below, one of the major benefits of cooking with cast iron is that it is chemical free. This is a very attractive option for many. It’s a great excuse to buy some Enamel Cookware. We have a Dutch Oven that we love. It takes your cooking to a whole new level! You will never cook any other way. Some of the other benefits are you use less oil in your cooking so you save on calories, you can also bake in your cast iron skillet as the even heat distribution delivers a perfect crust and no sticking! Overall, they are easier to clean and they stand the test of time. In the end, their durability will save you money. Purchasing Cookware is a big investment and there are some things that you will want to keep in mind. This Infographic outlines 10 of the best. Did you know that some metals react with food. This results in metal being released into your food. 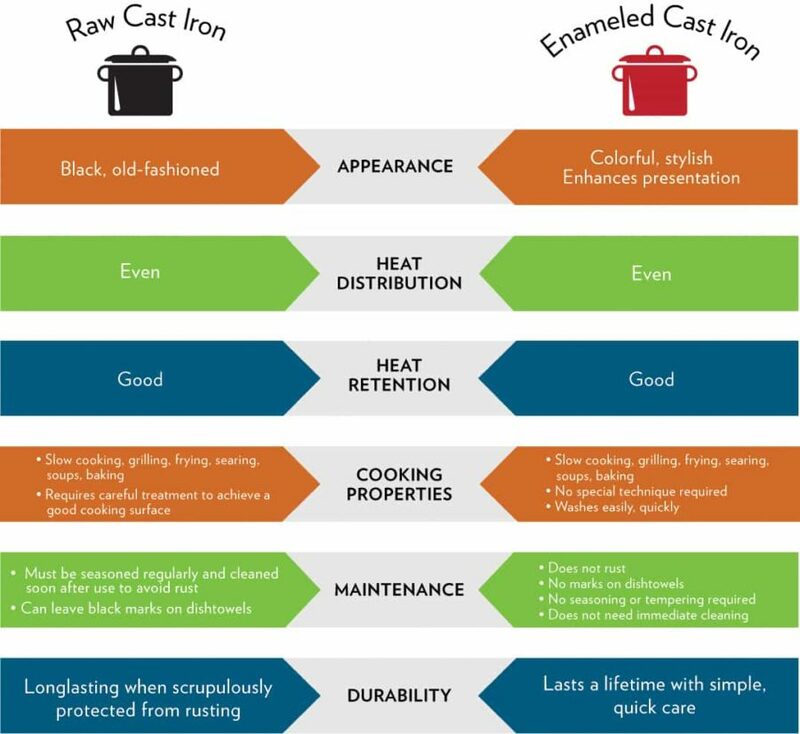 In the Infographic above you can see the comparison between Raw Cast Iron and Enamelled Cast Iron. Either is great choices. You might like to use a combination of both. 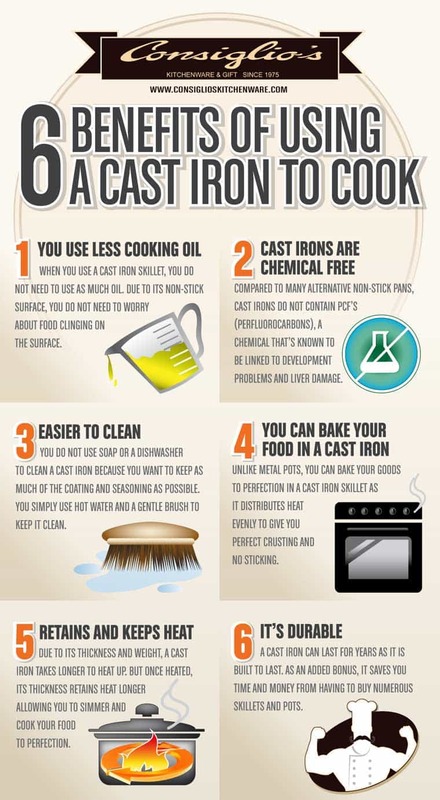 This infographic from Kitchen Professor outlines 10 exceptional reasons that you should make the change to cast iron including the fact that it retains heat superbly, it uses less oil and you can even serve your meal from your skillet to table. You can also make bread in it. Now, back to your Enamel Pots. We hunted high and low for the best homemade solutions and the consensus seemed resoundingly in favor of Magic Erasers and Baking Soda. Yes, you heard right! Simply mix up a paste of Baking Soda and water and apply with a Magic Eraser. If you’d like to make your own and save dollars, we have a diy version here. 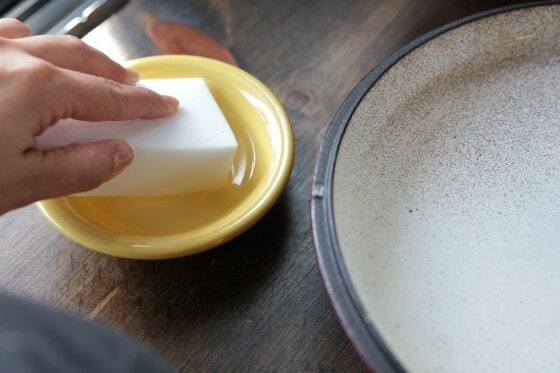 You will need to wash your Dutch Oven or Enamel Cookpot as normal with a sponge and dish soap. You only want the burnt on bits of food and stubborn stains to clean. Make sure you soak the Eraser in water first before you start scrubbing. Your solution should be equal proportions of water and baking soda. Country Cleaver has all the information on their website and they say that it really works. There are 8 major things lurking in every mattress and they will deplete your quality of sleep and cause all sorts of allergies and nasties. The new year is the perfect time to rotate and clean your mattress and we have a super easy way to show you how. View now. As we get older, getting our clothes to flatter us can be more challenging. Today we share with you 10 top tips that are easy and inexpensive that will hide your tummy and make you look instantly slimmer. We were thrilled with what we learned and you will be too. Watch now. You won't believe how many uses there are for Vaseline and we have a list of 50 that will blow your mind! You will love the household and beauty hacks and we are sure there are plenty that you don't know. Check out this post now! Store bought cleaners are full of toxins and chemicals. Today we are sharing the best homemade recipes that you can make with simple ingredients that work a treat. We have every cleaner under the sun so you can throw out the poisons and clean green! Grab your pinnable charts now. If you use Diffuser Reed Oils in your home, you will be excited to find that you can make your own at home using only 3 ingredients. Learn how to customise them with essential oils and save a fortune on refills. Your home will never smell so good and you will save a small fortune in the process. Watch the video tutorial now. Most people are wearing the wrong shape glasses for their face. As a result, they are missing a huge opportunity to look younger and more vibrant. Chances are your shape is working against you. Find out the easy trick to working out your face shape. If you wear glasses, be sure to view this post. Are YOU your worst enemy? There are 15 things that you can choose to give up today that will ensure you have the happiest life ever. We have pinnable charts and show you how to let go of anxiety and fear and move your life into top gear. This post will rev you up and make you realize there's plenty worth living for when you remove the mental clutter. Don't miss this! There are so many toxins and chemicals floating around in your home but if you select the right plants, you can create a wonderful, oxygen-filled environment that will make you breathe easy. We have the famous NASA Chart that you need to Pin plus a quick video of all the top plants that will literally change your world! Do you know the easy trick to fold a fitted sheet? You will love this clever hack that will see you say goodbye to the dreaded ball once and for all! Watch Martha strut her stuff in the short video and grab your Pinnable Cheat Sheets too. If you forget to take the meat out of the freezer, today you will learn the quick thaw method that is the safest way and does not use a microwave. This is approved by Americas Test Kitchen and the FDA and it's very simple. View details now. Life is made for living and for doing and saying all the things you want and need to. Don't wait until it's too late! Our post tells you the #1 regret that many own up to on their deathbed. Don't let it be yours. This article is eye opening and will empower you to live differently. If you have thin and sparse eyebrows they can make you look washed out. Today we show you how to disguise them so you have a wonderful defined brow that looks completely natural and frames your face perfectly. We have a pinnable cheat sheet chart and a video to show you how. The results will be a new and improved you just in time for the holidays.